This site has covered a lot of different engine swaps, particularly SHO Taurus engines of the V-6 Yamaha variant. Whether it’s going into a Focus, a classic British car, or a classic Japanese car like the 240Z, we’ve got it here. Follow our Engine Swap category or SHO tag in our blog for the full stories. But this swap is the king of all SHO engine swaps. When the original Lotus Esprit debuted, it was powered by a straightforward but not particularly exciting 4 cylinder naturally aspirated engine. The turbo and the V-8 models came along later, along with major chassis improvements. But the styling of the car stayed basically the same: a classic wedge shape as only Lotus has done so well. The early models, such as this 1980 model, were unencumbered with spoilers and other paraphernalia that some believe took away from the basic shape that made the car so famous. Giorgetto Giugiaro styled the original car, and it came out in 1976. By the time production ended in 2004, the car had received updated styling, major suspension changes, and had moved all the way up to a twin-turbo V-8 engine. So here you have an early car, with the classic design, and very much in need of an engine to match. The SHO Taurus engine, built by Yamaha for Ford and offered in the 1989 thru 1995 Ford Taurus, fits the bill perfectly. It’s a truly exotic engine, with an unheard of (at the time) 70 HP/liter. Under-rated at 220 HP (and easily capable of more with a slightly opened-up intake and exhaust) and fully capable of 9000 RPM, it was limited only by the inability of it’s conventional Ford accessories (power steering pump, alternator, air conditioner) to turn that high. In those days, the SHO had a unique engine (unlike the current SHO which uses an off-the-shelf Ford piece). This engine is unique and worth saving – if you ever come across one, save it for a project like this. The Yamaha SHO V-6 engines far out-live the Taurus they came in, but if and only if the original owners followed all the maintenance rules. A valve adjustment is required every 60k miles, and without it the exhaust valves will begin to get gworn down. Most owners probably didn’t have the adjustment done by their dealer as it was very expensive (note that this author did have it done on his original and very early production ’89 SHO). 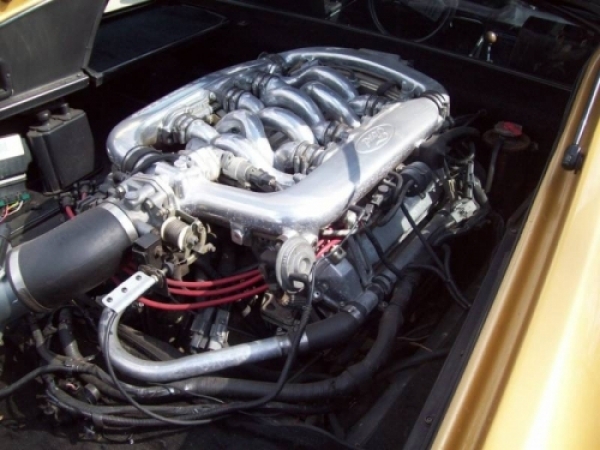 This SHO engine swap is probably unique as far as a Lotus Esprit recipient. The net result is a very highly desirable car. It was offered on eBay in March 2010 and didn’t sell with a reserve price of $15k. The swap would appear to be done very well, and the owner claims all the emissions equipment is present and working. That means it can be registered anywhere in the country, particularly since the engine is considerably newer than the chassis. The standard Lotus/Citroen 5-speed gearbox was retained (certainly better than the miserable Mazda gearbox that came with the SHO). Wheels and tires are aftermarket, but the rest of the car appears stock. The swap was performed in 2001 by Chuck Beck Motorsports in Azusa, California. Historical aside: this isn’t the first Esprit with a Ford engine in it. Ford itself built an early Esprit with a Mustang SVO engine. But they couldn’t come to an agreement with Lotus to sell it. Lotus’ own turbo 4 cylinder engine started at 210 horses in 1980 and ended up with 300 before being replaced by a twin-turbo 3.5 liter V-8 @ 350 HP (with a potential of tuning for as much as 500 HP, but also with an inherent coolant leak problem). Ford’s own supercar prototype, code-named GN-34, was fitted with a SHO engine and was intended to receive the ultimate Yamaha SHO engine with 3.8 liters and 5 valves. The Gallery section of this site hosts all the available pictures of this swap; a sampling is shown below along with two videos. The original Esprits were very clean. Later Esprits came with large all sorts of tacked-on spoilers, even a large hoop spoiler. This is the one to get. The SHO engine fits like it was designed for it. 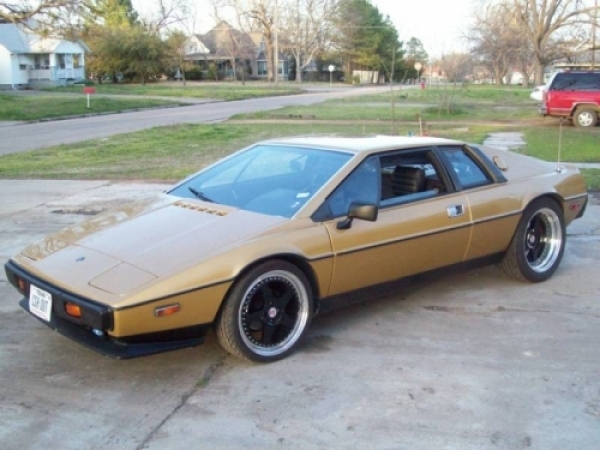 And the exotic intake works very well with the exotic body of the Esprit. 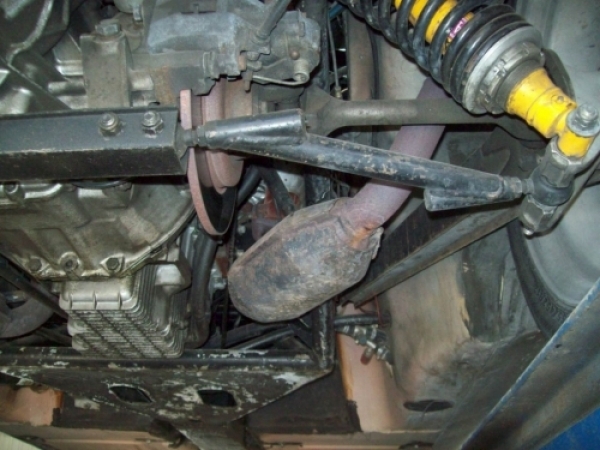 The suspension design is crude by modern-day standards. But you can see that the SHO engine fits naturally and allows for dual exhaust to be used. The engine probably makes around 250 HP in this example. Note the inboard solid disc brakes.